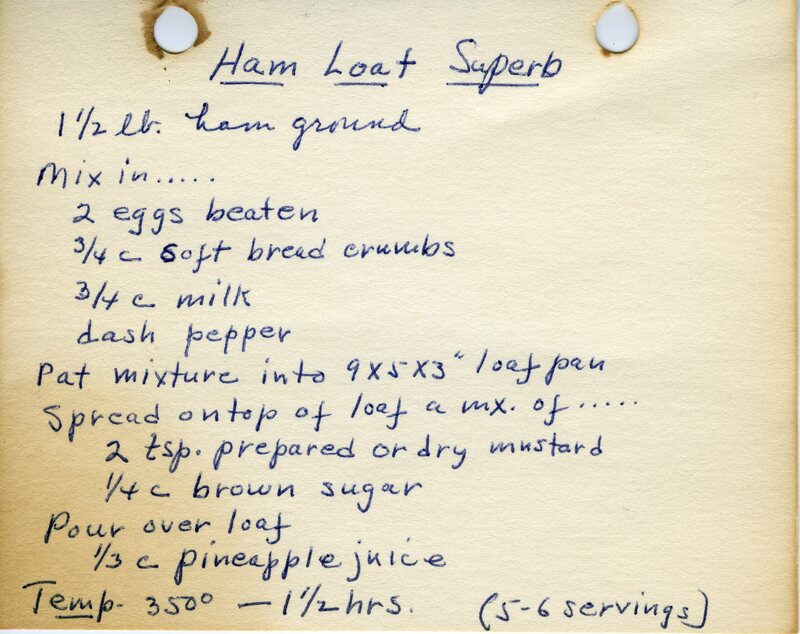 Quite some time back I posted a recipe for Gram’s ham loaf, and here we have another. I still contend the ham loaf is a midwestern/eastern thing, as I have never in my life (except for in Ohio) seen or heard of ham loaf. If you have left over ham from your holiday dinners and received a meat grinder for Christmas (you too?) you could give this a spin for a Thursday night sometime. Scalloped potatoes and greens on the side, yummmmm! That is interesting that you have never had ham loaf. Where were you when I made it? Maybe it was when you were at college, so therefore you didn’t have it. Then again, I have a recipe for a Ham and Cheese Casserole that you would find in my original cookbook. It came from Helen next door to us. It is yummy! and uses ground ham. If you have a Cuisinart you would pulse the ham in smallish batches with the sharp blade just until it is the right consistency. But an old fashioned meat grinder does it best. I still have mine (Gram’s). I do remember ham & cheese casserole – that was yummy! So where’s the Ham and Cheese Casserole recipe? Sounds yummy and I’d love a great recipe.